Height Adjustable and Extendable. 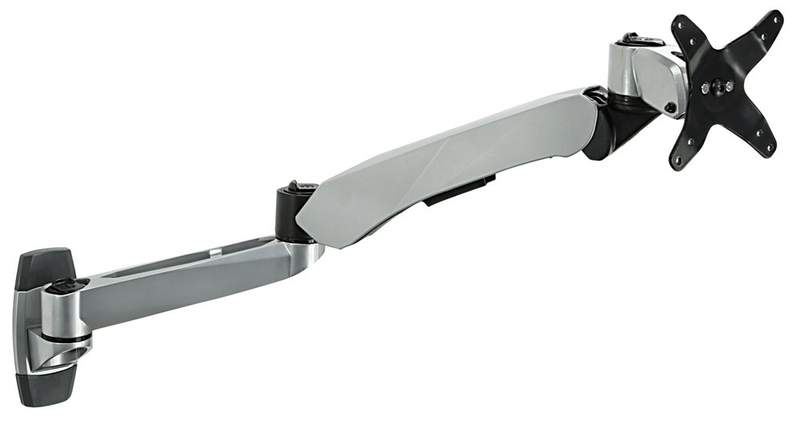 The height adjustable arm has a range of 11.5 inches. Raise up your monitor above your desk, bed, or furniture for an ergonomic viewing angle and prevent strain on your eyes, neck, or back. The wall mount arm can fully extend 27.5 inches from the wall. The quick release action, high gloss aluminum metal, arms have a load capacity of 19.8lbs. Weight Capacity: Supports 4.4 - 19.8lbs (2 - 9kgs); Tilt: 105 Degree; Rotation: 360 Degree; Swivel: Max 360 Degree; Mounting Pattern: VESA compliant: 75x75 and 100x100; Maximum extension: 15.75" (400mm); 7.87" Height adjustment. ^Wall-mountable ^Quick mount & quick release designs at 3 connecting points: stand, spring arm and monitor end. Swift and easy movements and adjustments. ^Clean look with minimal hardware visible from underside of work surface; Neat and efficient cable management; Maximum productivity and supreme ergonomic comfort; Easy installation and dis-installation. ^Increase viewing comfort-help reduce eye, back and neck strain. Solid Aluminum die-cast construction; Space saving with its compact design.